Heather Little was raised on a small farm in an even smaller rural community in the beautiful Annapolis Valley of Nova Scotia, Canada. The youngest daughter of a retired military father and home-maker mother; she got to spend plenty of time with her father. It was due to his zealous imagination, that Heather developed a love of the written word at a very young age. His resourcefulness and ingenuity at turning her four year old scribbles into wild tales of adventure which he told to her as bedtime stories are what set in motion a life-time love of the written word and the want to become a storyteller herself. 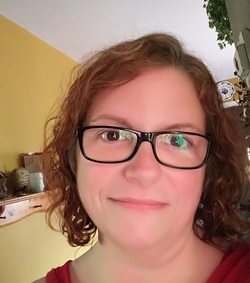 A member of the online writing community, Writer’s Carnival and a member of the Writers' Federation of Nova Scotia, she is also a mother, lover, reader, writer and caffeine addict, Heather has lived in the big city and the tiny community and has stories to tell. She writes from the heart (well, usually from the comfort of her couch) but you get the idea. Chubber is her first published novel and the first in a series of four YA Novels; the second planned for release in early 2017. Remember when you were a kid in middle school and the most important things were trying to fit in, trying to belong and just wanting to be liked? Then puberty comes along and gives you the smackdown. Toss in mean girls, bullies and not to mention: discovering boys... Whoa! How does a girl cope? Well with best friends, of course. Join Lucy as she encounters life full-on, learns how to accept herself and discovers the true meaning of self-worth and friendship.